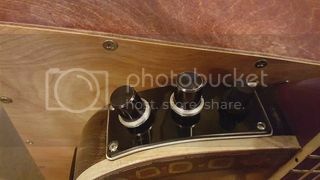 When I changed out from 2 to 3 controls I found that I was not fond of the knobs on the new system so I'm In Search Of a match to make the trio look like the original. Here's a pic of the controls and what the originals look like. If you have a spare you would be willing to part with please let me know, it would be much appreciated and I'm more than willing to purchase and pay shipping! I have no idea if these came only on the Spirit series or on any other models. 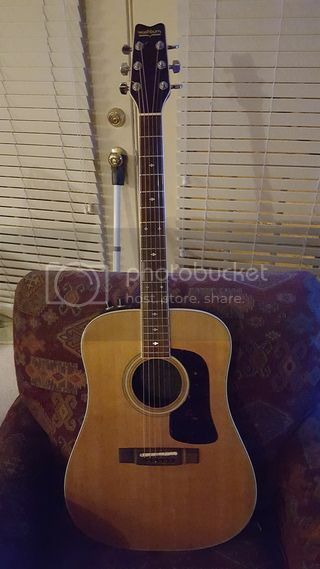 Acoustic Guitar Players Post Comments & Questions / Re: SBF 26 Spirit Saddle help needed! 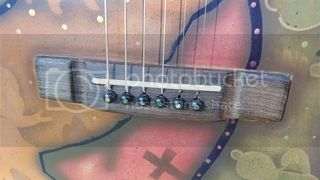 Finally got the artwork done, bridge modified and new electronics installed. He made an ebony insert and you have to look real hard to see it. Finally go the upload to work, it's been awhile! Here's the before pic. If you can zoom in you can see the saddle is cracked in half. Thanks, J. Instead of a DIY job I decided to take it to a luthier and have the slot filled and re-cut for a 1/8" saddle and install a B-Band A11 per-amp and 1/8" UST. He will fill with epoxy and color match the bridge as close as possible. Also as part of the mod, add a battery box on the lower bout by the jack and make a new plate for the 3 control pots vs the previous 2. Should look like an SBF 24 Mirage when I'm done, as the B-Band has a volume, high and low pot. The whole concept of a solid body acoustic was intriguing to say the least but it makes sense. On stage, typically we use a sound hole cover to reduce feedback, so why not just bypass a hollow body altogether and have a nice thin body with an acoustic pickup? Not that I'm on stage much but like I said its an intriguing concept. It's a project and so far I'm happy with it and can't wait to fire it up with the new system! 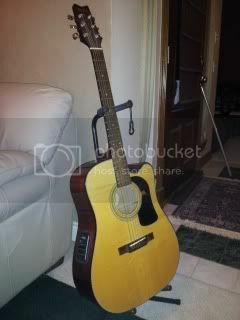 Acoustic Guitar Players Post Comments & Questions / SBF 26 Spirit Saddle help needed! Hey everyone, it's been awhile since I posted on the forum but check in now and then. 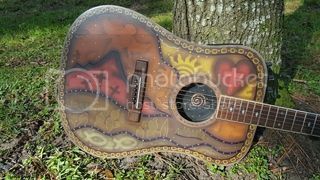 I recently decided to do a project guitar that involved a custom paint job, but that's for a later discussion :-). My SBF 26 Spirit is a 1983 model with a passive system that I knew would need to be replaced. 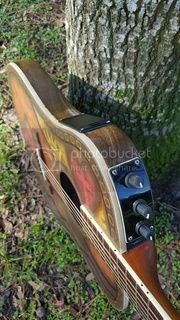 I did a lot of searching to see if anyone had done a similar mod, but info on these guitars is very slim. So, I bought one on ebay not 100% sure of what I would be facing, and even though I don't think it's insurmountable, it is posing a challenge. Turns out the saddle on these is just shy of 1/4" wide, which was a complete surprise but it looks like that's what was needed to accommodate the UST they used (looks like a strip of copper with piezo crystals embedded). So, the old system is coming out and of all the after market UST's I have seen are either for 3/32" or 1/8" saddle. I've decided to use the B-Band A11 system since it will be the best fit (has 3 pots that are wired, not attached to a PCB) and looks like it has good reviews. 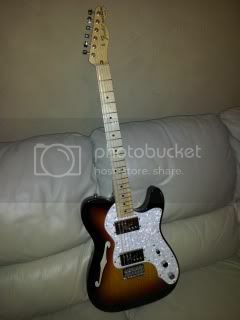 I thought about using a AST pickup but the solid body has very limited space to work in. Now comes the decision - with a 1/4" saddle slot, I have several choices, and maybe some that I have not thought of so please toss out any other ideas! oh, and the current saddle wire goes through the middle of the slot, not at the end as is typical, which was just another wrinkle in this project. If needed, I can fill it in but it lands between the G and B strings so may not be an issue? Here's my list of options and pros/cons from my viewpoint. 1) use 2 - 1/8" saddles, one as a spacer cut flush with the bridge and one as the saddle. No, it's not mine! Saw this ad on Houston CL and thought I'd share in case anyone was interested. I'm in the general area of NW Houston so if someone from outside Houston wanted more info I'd be glad to stop by and have a look in person. My email is in my profile. Acoustic Guitar Players Post Comments & Questions / Re: Happy Bday DTOM!!! WOW - time sure flies by! Thanks for the birthday wishes, and expecially to CB for being such a steward of all that is Birthday Wishes! Yes it has been awhile, and don't think that I'm not thinking about y'all. Dugly, if you're still up for checking out the open mic at Dosey Doe on 1488, let me know...errr... maybe a text msg would work better than here... :-) My bad for not checking in more often. quick update - The D56SWCE gets a regular workout at church every Sunday, it's become my 'go-to' acoustic and really does sound great. Everyone that comes in to play with us always asks to check it out and comments about how good it sounds. Lately I've been playing the Tele and our worship leader plays it. After tweaking on my D43S that I got from Pike (fret level, mastadon tusk saddle and nut), she sings like an angel! 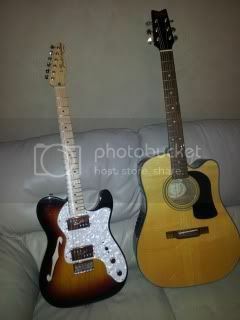 The D10SCE got all it's electronics changed out and is somewhere overseas via guitars4troops. Welcome to the forum! Did you get it at Guitar Center? I played a Washburn at GC awhile back and think it was a WD23SCE. Very nice sounding and good looking guitar. If that's it then it's one of those "special" runs just for GC. Happy New Year to all - I hope you all had a wonderful Christmas! I know that you can't have too many guitars. However, there occasionally comes a time to let one go. 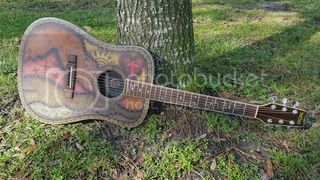 I had seen on Facebook that guitars4troops had to shut down their request site at 300 so there is obviously a big need for guitars for our troops serving our great country. So, the D12SCE got the call. The original electronics sounded kinda ****y so I swapped the whole thing out for a Fishman Presys Blend, and since it needed saddle mods I made a Tusq saddle for it. In the end it sounded great and it was bittersweet to let it go but I know it will find a new home with one of our soldiers. Take care and wishing everyone a great 2013. Rock on! Acoustic Guitar Players Post Comments & Questions / Re: Happy Birthday, Ryan!!! Yes, but it would help to post more information about it, how long you've had it, any background info, add the photo's to this post (copy and paste the IMG code from photobucket) and what you are asking for it, what's included, etc.